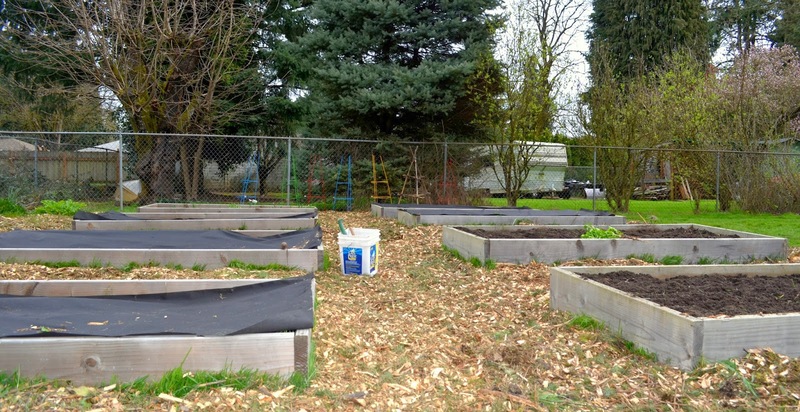 It's that time of year when the raised garden beds need to be cleaned out and early spring seeds can be sown. The past two weeks I have been hard at work spreading 16 yards of bark mulch around my raised beds. 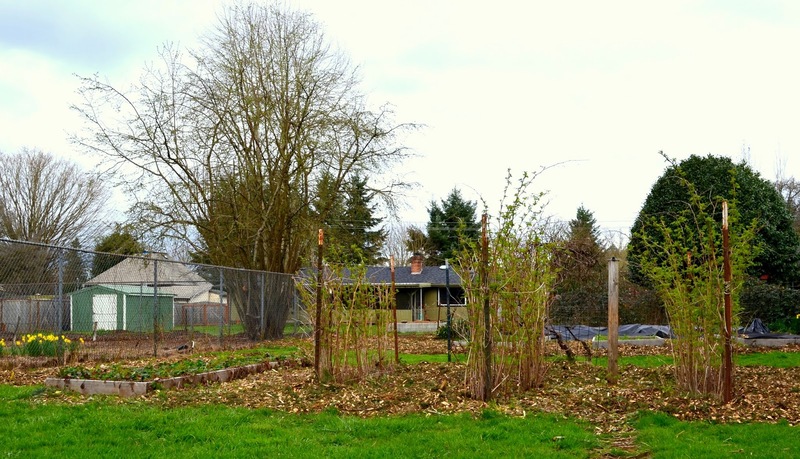 I wanted to help eliminate things like crab grass and other noxious weeds and it's my hope that by eliminating the lawn around the raised beds, that it will cut down on the weeds that make their way into my vegetable gardens. Why not just till the lawn around my boxes? It would seem potentially easier, but I want to keep the soil intact. Applying 4+ inches of bark mulch should help suffocate the lawn. I'm trying to follow some permaculture methods and keeping soil integrity is important. I got my loads of bark mulch by talking to the local companies that have been in my neighborhood trimming trees. They were delighted to drop it off for free. I cleaned a couple of my boxes out and sowed snow pea's, lettuce, radishes, spinach and swiss chard. To complete the task I placed tomato cages in the middle of the box and place bird netting over the top and secured the sides. Trust me, if you live with cats, you want to use netting over the tops of open boxes. I have three cats and have learned my lesson the hard way. While working on my raised beds, I found some fall vegetables that I sowed last year and forgot about! The strawberry box is looking healthy. I planted the strawberries as starts from runners I had in a bed at my previous home. They actually produced in their first year, last summer, and I expect this season to provide a great crop. Visions of strawberry shortcake about Father's Day are swirling in my mind! Yum! 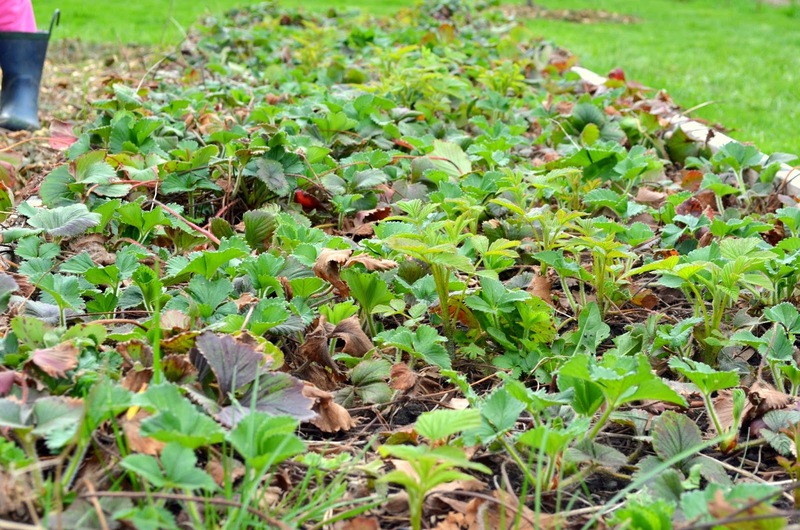 Strawberry plants are emerging after a winter's sleep. One of the other tasks that I've done is to move my young blueberry bushes from a spot that was just too shady. I moved them to a full sun space which I hope will help them grow and produce berries. I have six blueberry bushes total thus far. And the raspberries are waking up. It's been a busy few weeks with untold wheelbarrow loads of bark mulch wheeled into my backyard. My muscles have had quite the early spring workout. 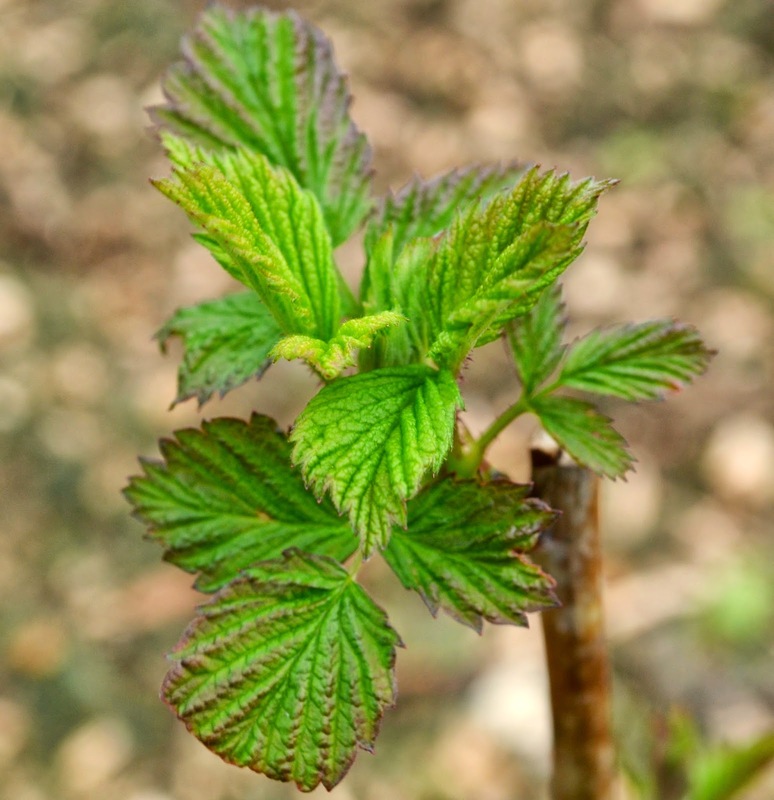 I'm excited that I sowed spring greens and that I'm seeing vigorous growth in the strawberry bed as well as fresh foliage from the raspberry canes. It's time to turn the food production back on. You will love having all those blueberry bushes. We are still using up the berries we froze last summer. Hope you are drying up some down there. We barely get a break and then it's back to rain again. I'm hoping the seeds I planted don't end up rotting. Hi Catherine, I can't wait to have blueberries. I've had these plants in the ground for a year and I just haven't seen the growth I expected, so my hope is that with the movement, they will be happier and I'll get more berries :) It's been wet off and on here too. I guess it's March but I sure can't wait for warm summer days! My strawberries that I got from you at last year's exchange are doing well too! I have them planted in the ground this year instead of pots and I have high hopes of some good crops from them. I never thought of using bird netting to keep the neighborhood cats out of my raised veggie beds. I use wooden skewers stuck in the soil at intervals, which works, but I use a lot of them every year since they eventually rot. I'm going to switch to bird netting, which will also keep the birds out. The bird netting was very successful for me at my previous home. Kept my seedlings bird free and kept those pesky cats out. Plus, it was not too expensive. Wow! You sure have been busy! So exciting to have your vegetable boxes all cleaned up and ready to plant! Looking forward to your posts about their progress! Did you lay weed control fabric down first or just the bark mulch? Hi Sue, I just put the mulch down. Most places got about six inches thick. I know I'll have to keep adding to it yearly, but I don't mind. It's a good work out. We even got a notice from the electric company offering chips. This was weeks ago but no show so far. Guess we'll just have to buy mulch after all. Did your kids help? Payback time for the soccer mom, if you ask me. 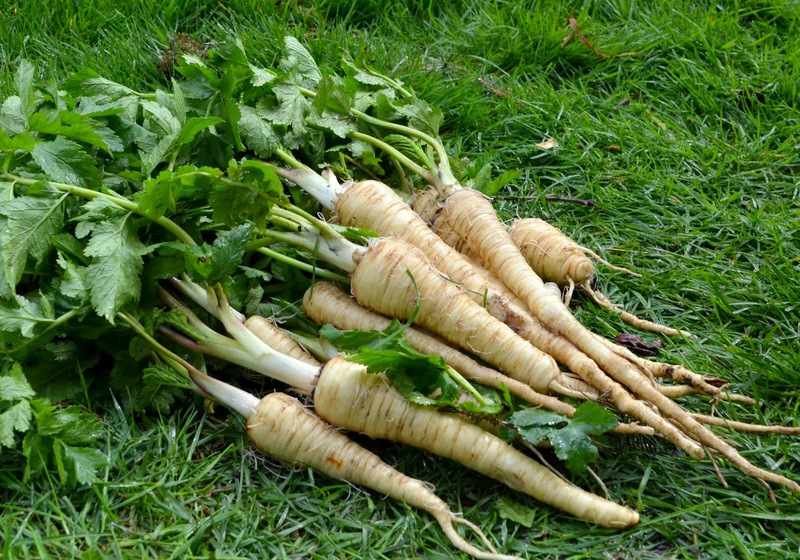 The parsnips look great. I am always trying to keep cats out of flower beds and vegetable growing areas. They seem to never be fully deterred, they think the turned over soil is for them! Great post! Lists of good info. I was wondering how thick your mulch is as well, but you already answered. Would you out six inches down next year as well or will it last? Yes, it's so nice to feel able to get on and do stuff in the garden. I have started sowing and planting in earnest now, and my little plastic greenhouses are rapidly filling up with seedlings. I plan to sow my tomatoes and plant my potatoes ths coming weekend. Your hard work will pay off soon. I'm looking at your strawberry bed and thinking, that I might not have enough of my plants. Good for you! Though I am envious. I have at least two months before I see my beds. I love the strawberries. I bet you were excited to see the forgotten veggies. A pleasant surprise. Happy gardening.